This year’s Key Forum at the Garma Festival of Traditional Culture wound up with a re-commitment to the importance of self-determination in all aspects of Indigenous people’s lives. 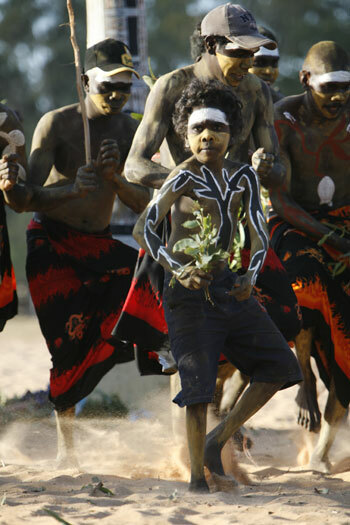 The three-day forum is coordinated by Charles Darwin University and operates as part of the annual, five-day Garma Festival held at Gulkula in north-east Arnhem Land. This year the Key Forum attracted a capacity crowd of 400 Indigenous leaders, health professionals, policy-makers, academics, and government and business representatives, who discussed the theme ‘Indigenous health: Real solutions for a chronic problem’. Workshops focused on specific areas such as traditional health, maternal and child health, and social and emotional well-being. The forum heard from men’s groups who were working to re-empower Indigenous men, strategies that are reinforcing identity in the desert regions, a midwifery program in Samoa which is helping to lower the rate of deaths of women and babies during childbirth, initiatives of the Inuit people of northern Canada who were working to diminish non-physical violence within the community, and the authors of the Little Children are Sacred report, Pat Anderson and Rex Wild QC, who spoke about their report and some of their 97 recommendations. Commissioner Calma said it was essential that in attempting to improve health outcomes for Indigenous people that recognition had to be given to those areas which were working well. 'We don’t have to recreate the wheel. It’s all there. We only have to rejig it,' he said. He also highlighted the need for those present to help 're-orientate the media’s thinking' about and depiction of Indigenous communities. Commissioner Calma urged everyone present to be active in changing opinions on Indigenous health once they had left the forum. 'Be educated about the facts. Ask the hard questions. Talk to relatives; challenge and educate them. Write to local Members (of Parliament). Write to newspapers,' he urged the gathering.